The two sentences3 about Mrs. Langtry4 and Albert Edward5 can simply be cut out6, and the following sentence can begin "Ray deposited these pictures" etc, instead of "He deposited" etc. I shall be glad if Murray7 takes the book8. About your suggestion9 for the Book News Monthly10 I shall write you tomorrow, when my trunks are unpacked and my head clears, and when I hope to have a better implement than a quill pen. Cather is expanding on instructions given in #0325 (by telegram). Murray published The Song of the Lark in March 1916. On 21 October 1915 Greenslet wrote that there would be a "special Cather number" of the Book News Monthly and the editor wanted "some special article" by Cather, "say a brief account of your summer adventures." 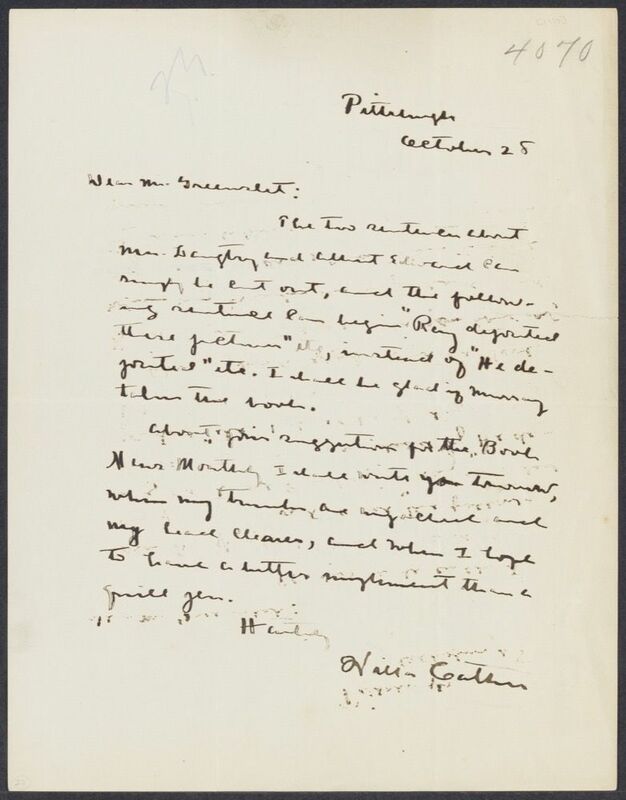 He also inquired wether Cather could suggest "some well known man" to write an appreciation of her and her work. Langtry, Lillie (1853-1929). British actress. Born Emilie Charlotte Le Breton on the Isle of Jersey, she was nicknamed "Lillie" because of her fair complexion. In 1873 she married sportsman Edward Langtry, and the couple moved to London in 1876. A year or so later, she met the painter John Millais, who painted her in "The Jersey Lily." She became a famous beauty and a favorite in London society, having affairs with royalty, including Edward, Prince of Wales, and his cousin Prince Louis of Battenberg, by whom she had a daughter. When she was in desperate financial circumstances, Oscar Wilde suggested she go on the stage; she worked hard at her acting, and was very successful, investing her money wisely. She was acclaimed in America on her first tour in 1882, and she returned often, becoming an American citizen, which enabled her to divorce Langtry in 1887. As a reviewer for the Nebraska State Journal in 1894, however, Cather scoffed at Langtry’s acting talents and the worship of her by American audiences. 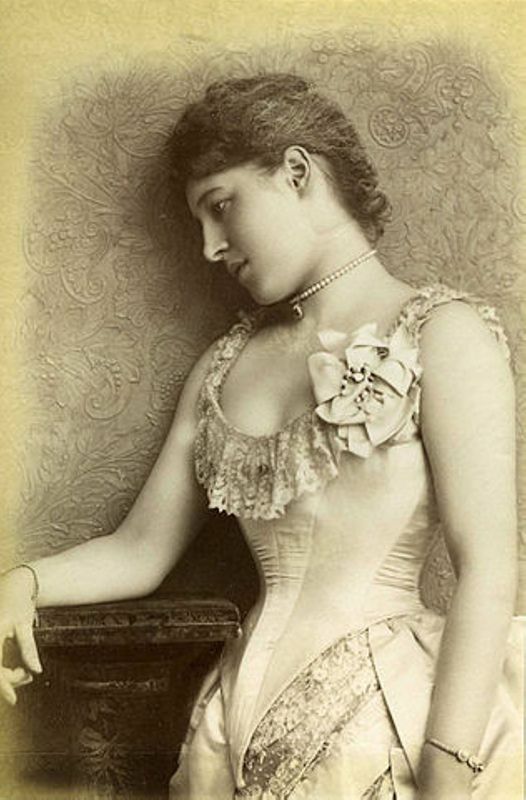 Lillie Langtry eventually returned to England to live, marrying Hugo de Bathe in 1898 and becoming Lady de Bathe in 1907. She separated from her husband and lived her last years in Monaco with her companion, Mathilda Peat. Langtry in her late life may have served as a prototype for Gabrielle Longstreet in Cather’s story “The Old Beauty” (1948). 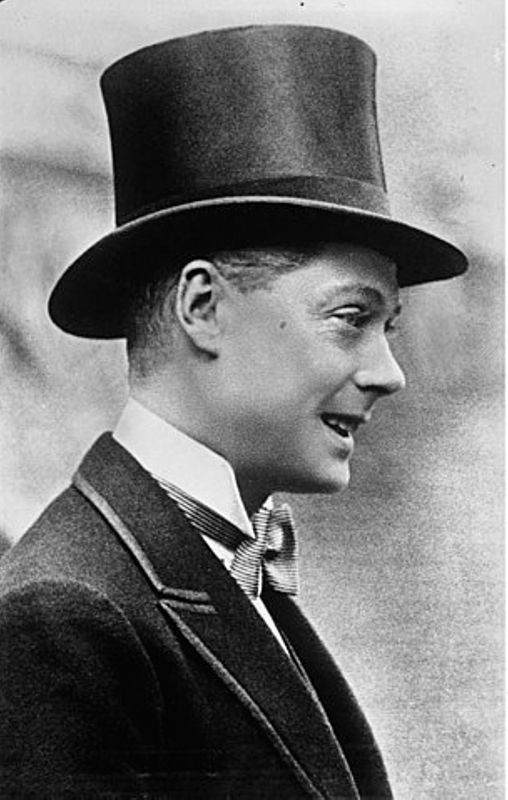 Edward VIII (1894-1972). King of the United Kingdom and Duke of Windsor. Edward VIII became King of the United Kingdom in 1936 after the death of his father, King George V, only to abdicate less than a year later to marry Wallis Simpson, an American divorcee. After abdication, Edward was given the title the Duke of Windsor and embarked on a jet-setting lifestyle. During WWII, rumors circulated that he and Wallis were Nazi sympathizers. Because Edward was a favorite of tabloids, Cather undoubtedly saw reports of his exploits and on at least one occasion expressed sympathy for him. Murray, John, IV (1851-1928). 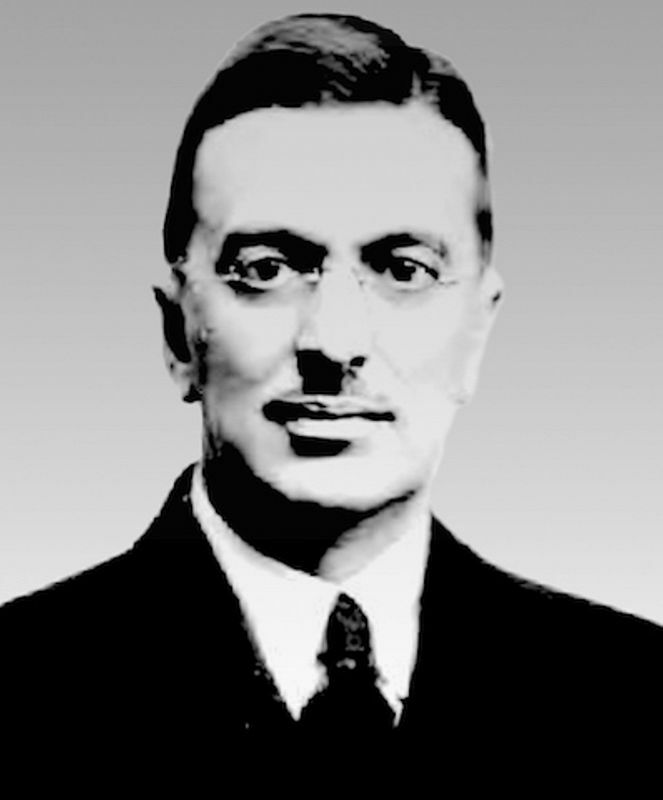 British publisher. In 1878 John Murray IV began working in the London publishing house of John Murray, established by John Murray I in 1768. John Murray IV was appointed publisher to Queen Victoria. In 1916 his firm issued The Song of the Lark (1915) after William Heinemann declined it.